Estate and Driveway gates in Bonita Springs provide protection to your property and elevate the appearance of your home. Fine Lines specializes in aluminum fencing, and they create gates that are a worthwhile addition to your residence. When I asked Fine Lines about a gate for my home, I knew I was putting my home’s safety in good hands. They were able to create a gate that matched the appearance of my home, creating a unified look for my entire property. 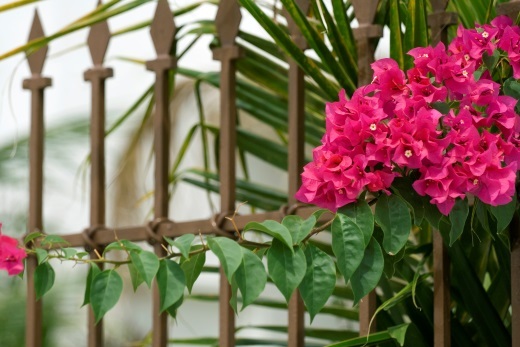 Keeping unwanted guests out of your property is easier when you have a gate. It seems simple, but it brought me great comfort to have control over who entered and exited my property. I’m not a hermit or anything! I just like knowing who is on my property. I felt like my home was finally the secluded sanctuary I always wanted when I got my gate. The power you have with a gate gives your home additional security and a greater sense of privacy. Estate & Driveway gates can keep your small children away from the street. Your family will be safe and sound. Solicitors, nosy neighbors, and strangers were no longer a problem when I got a gate for my Bonita Springs home. Fine Lines utilizes the sturdiest bolts and hinges to ensure that your gate will hold up against intruders. Estate & Driveway gates in Bonita Springs can give your home a sophisticated style. I have a regular sized driveway, so I got a single gate, which has one panel that slides open. They also have dual gates for larger driveways or estates, which can slide or swing open. Dual gates have two panels that elegantly open to welcome your guests. Fine Lines will ensure that the design of your gate is customized to suit your needs. A variety of design options, colors, styles, accessories and heights are available. My gate perfectly coincides with my home’s beachy, rustic, old Florida look. Pool fencing is a serious matter in Florida. It might sound dramatic, but it’s not. Most people don’t know that if it is not done correctly, you will probably be slapped with a hefty fine. Regulations are strict because Florida has the highest drowning rate in the nation for children under five, and fences have been proven to reduce the risks of drowning accidents by 85%. If you have a pool, you need to have the proper fencing. When designing your pool landscape it’s easy to forget about the fencing. Understandably, many people are more focused on the actual pool itself—why wouldn’t they be? The last thing you want to do is deter the attention with a fence. You need a pool fence that is safe and will complement the pool scene and beautify your landscape. For your home swimming pool or Jacuzzi, some decisions have fewer options. For example, the company you select to build your pool must be licensed, insured, and experienced. Each type of fencing has a different set of qualifying rules. It’s important that you hire a pool fencing company in Bonita Springs that not only adheres to the codes and regulations, but one that has a versatile selection of fence designs and accessories. To best balance your need for a great looking, durable, and secure pool fence at a reasonable price, look for a fencing company that specializes in aluminum products. Aluminum fencing gives you the best and most beautiful bang for your buck. It is low maintenance; you don’t have to deal with rust or the bothersome upkeep issues that come with wooden fencing. When you have your own specific ideas about how you want your fence to surround your pool area, while at the same time providing an inviting look that doesn’t distract from the aesthetics of the pool, it’s good to know there is a local pool fencing company in Bonita Springs that has enough knowledge and experience to give you an estimate from an emailed sketch. You just bought an old vintage two-story home in Bonita Springs with a second story wrap around balcony overlooking your backyard and several acres of your property. You need to renovate the balcony and decide on the all-important railing. The smart choice would be to hire a company specializing in the design and manufacture of railing systems. With the second story master bedroom on one side of the house, the kids’ bedroom around the corner, and a small guest room also opening out onto another side of the balcony, you’re going to need a balcony railing designed to not only complement the architecture of the house, but balcony railing that also provides fall protection. When fall protection is a concern, it is of course wise to choose a company familiar with the local building codes; a company with a history of building a variety of railing systems in the area. Whether it’s for a commercial property or building, swimming pool fencing, or in this case, a residential structure, selecting a railing system is not only an aesthetic choice; it’s equally an issue of safety, especially when it’s railing for balconies. You should consider a company with local experience that does it all, from design and fabrication to delivery and installation. With a balcony where your family and friends are expected to spent time relaxing, inferior workmanship is not an option. Experienced workmanship is imperative. You also want your railing system to have a great looking, long-lasting durable finish. As most people, if you are concerned about pricing, and you find an established company specializing in railing systems in Bonita Springs advertising a promise to better any quote you have from competitors without sacrificing quality, then you have taken the first successful step toward realizing your railing or fencing project. Sometimes it feels better to live in a gated community, especially for safety purposes. A lot of the time, instead of appreciating the aluminum fencing in Bonita Springs for keeping us safe, we get angry at the gate for not opening fast enough or being inconvenient. We never really consider where the fencing comes from or who put it there with our safety in mind. Another thing we don’t consider is when it becomes that time in your life where you are considering buying a house, it probably won’t be a gated estate, and there goes the safety precaution that you took for granted. Why would you need aluminum fencing in Bonita Springs for your new home? Well, maybe you aren’t in the best area and you would like a little more protection. Or, maybe you are planning on having children sometime in the near future. Protecting your children is one of the most important jobs that a parent has. Getting a driveway gate on your property could help ensure your child’s safety. It would also be pretty impressive to have a gate at the beginning of your driveway when you are having guests over. Envision the fight that your friend is going to get into with her husband because she “wants a gate too.” Not to mention that you can customize your gate to make it that much better. If you like the sound of having your own privately gated community, or just want to know more about aluminum fencing in Bonita Springs, give Fine Lines a call at 1-(800)-742-8563 and they can provide you with more information. Ensure your child’s safety and start a fight among another couple because you have something they want; It’s a win-win situation. Surrounding my apartment complex is an ornamental aluminum fence. It’s perfect because we’re located in a busy area on the edge of an intersection. Our fence helps keeps strangers out and the younger kid’s safe inside. I didn’t notice or appreciate its functionality until a woman crashed into a part of the fence and knocked it down. The gaping hole in our protective border was jarring to say the least. Suddenly our community felt exposed. Anyone could walk through the downed section and walk onto our campus. The apartment owners quickly got someone to fix the fence so as to restore the safety of the residents. Things returned to normal but I haven’t forgotten how safe our fence makes me feel. Ornamental aluminum fencing is a great option for anyone looking to add value to any home while increasing their security. This is especially useful for families looking to protect pets and young children from wandering out into the road. The experts at Fine Lines Aluminum Fencing have been serving the Bonita Springs, Orlando, and New Port Richey areas with quality fencing since 1960. They handle the entire process from designing the fence to engineering and fabricating it. You’ll never have to deal with another fence company again! Fine Lines only uses the highest quality materials. Other companies will use pickets that are 5/8” but they only use ¾” pickets to ensure that their fences are sturdy. This way, if an intruder tries to break through the fence, our pickets will stand strong. Whether you need a swimming pool fence, estate and driveway gate, residential fences, rail systems, or commercial fences, Fine Lines offers the most variety for ornamental aluminum fencing. If you’re in need of extra security around your home, then call Fine Lines today to talk with their fencing specialists. Most people don’t think too much of fences. They aren’t something too many people seem enthusiastic about. But maybe that would be different if they knew what the right fence could do for their property. Or, to put it more specifically, the right Bonita Springs fencing company. Although there a number of different types of fences one could invest in for their property, aluminum fencing is by far the most popular—and with good reason. Not only is the material of this fence durable and reliable, but the pricing is extremely affordable. Fine Line’s Aluminum Fencing of Bonita Springs and Orlando offers a variety of different styles. Whether you are in the fencing market for your residential or commercial property, whether you need to protect your driveway or pool area, they are the premier company to go to. If you are looking for aluminum fencing for your Bonita Springs property, it is important you get them from a company that offers maintenance free products. You also want to make sure they are made using the highest quality materials. After all, this is Florida where the weather is unpredictable and often harsh.